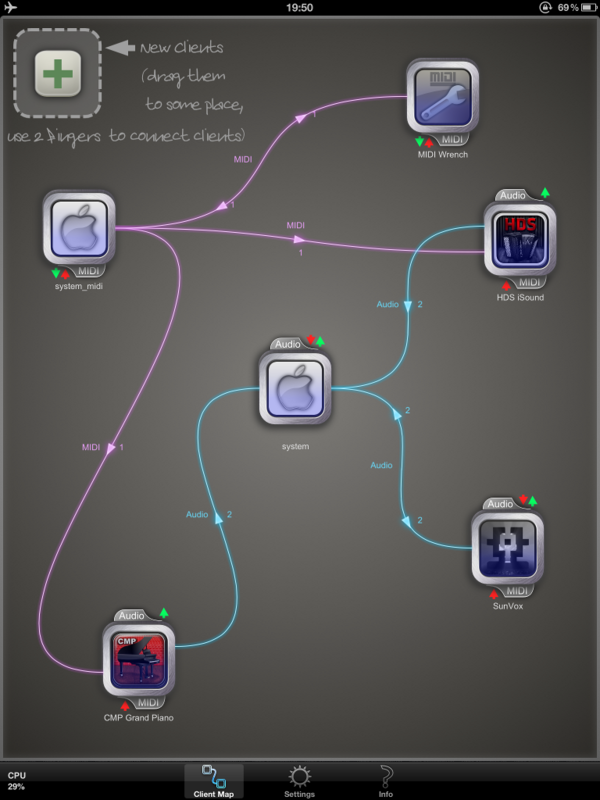 JACK is more than just one iOS app. 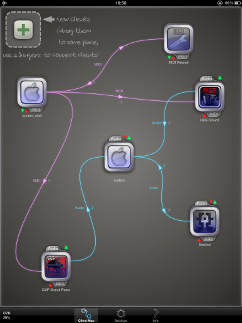 It is a system that connects the music and audio world on your iOS device. 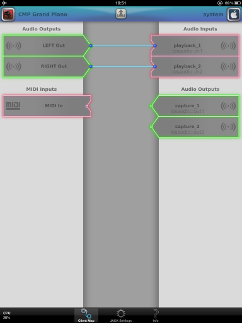 JACK allows audio channels and MIDI ports of your audio & music apps to be connected with each other. It does not force a predefined schema in which way apps shall be connected with each other. You can freely connect them in any way you want, intuitively like drawing on a paper. Besides audio & MIDI interconnection, JACK provides other very useful mechanisms to let your audio apps work together like never before. 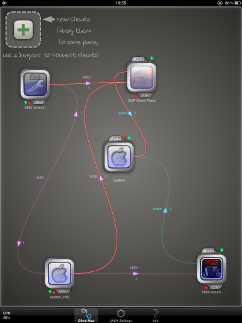 For example record/playback synchronization between DAWs and sequencer apps. Arbitrary data sharing among apps and much more. Even though JACK is quite new on iOS, it already came a long way. Providing you the most professional and powerful environment for your audio apps, highly optimized with explicit multi core support, low latency and maturity which it gained over many years of usage and development on other operating systems already. JACK is an open standard, which can freely be supported by anybody. 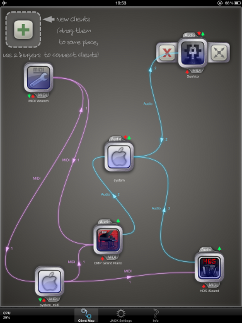 Audio connections between apps and external devices¹. 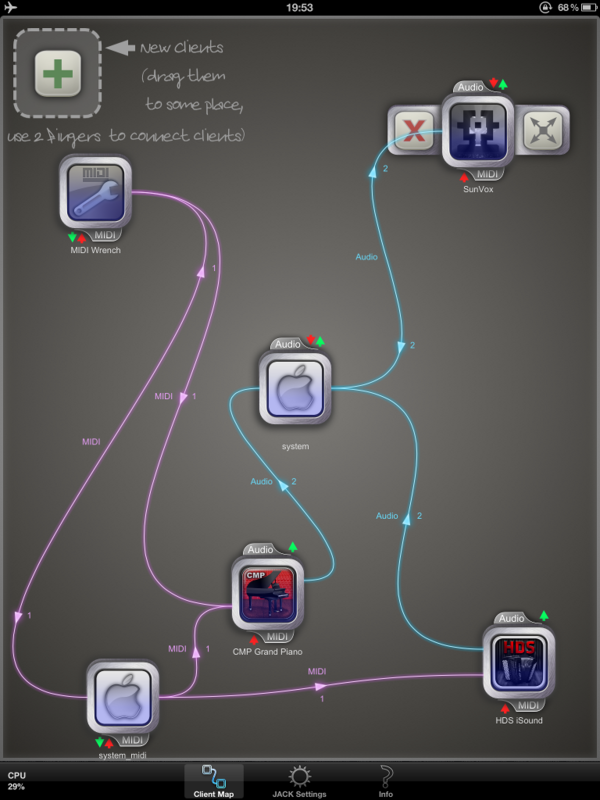 MIDI connections between apps and external devices¹. Multi Core CPU support for high performance (parallelized internal audio graph). Low Latency Performance (configurable, i.e. 2ms buffer sizes). Arbitrary, custom data sharing among apps (allows easy extensions of the system). Arbitrary amount of audio & MIDI ports per app, changeable at runtime. 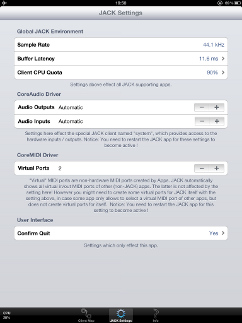 ¹ If you want to use external audio and/or MIDI devices: The adapter and/or the external audio/MIDI device you connect must be supported by the iPad/iPhone operating system in order to be able to use it with this app. To our knowledge there is currently no official list of supported devices by Apple. We recommend you to check whether your external device is supported by your iOS version, i.e. for MIDI devices: by using our MIDI monitor app MIDI Wrench, which is free! Apps in these screen shots, i.e. 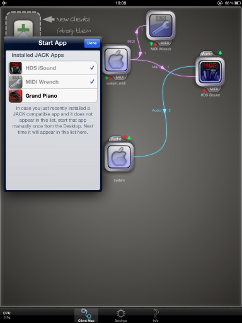 CMP Grand Piano and MIDI Wrench can be downloaded from the Apple App Store.  Example JACK Graph App "CMP Grand Piano" has one or more audio output channels and at least one MIDI input port, but no MIDI output and no audio input. 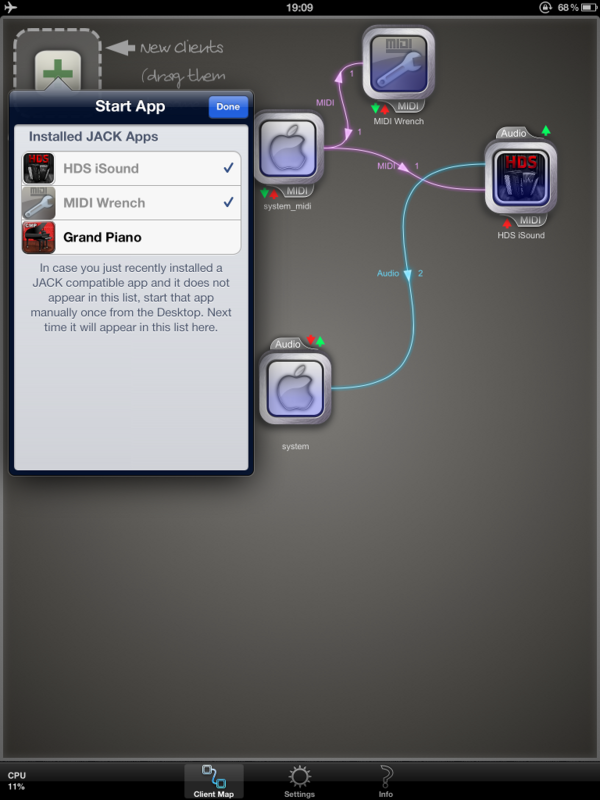 CMP Grand Piano Two audio connections from app "CMP Grand Piano" to the iPad's/iPhone's audio output speaker. MIDI Wrench One MIDI connection from some MIDI input device (attached to the iPad/iPhone) to the app "MIDI Wrench". And one MIDI connection into the other direction, that is from app "MIDI Wrench" to some attached MIDI output device. System "System" is a special JACK client, which is not an app, but instead provides access to the iPad's/iPhone's audio input/output channels (microphone and speakers) and MIDI input/output ports (if some MIDI device is attached to the iPad/iPhone). We frequently update a list with iOS apps that support JACK. You are an app developer and want your audio / music app to become connected with other JACK apps? 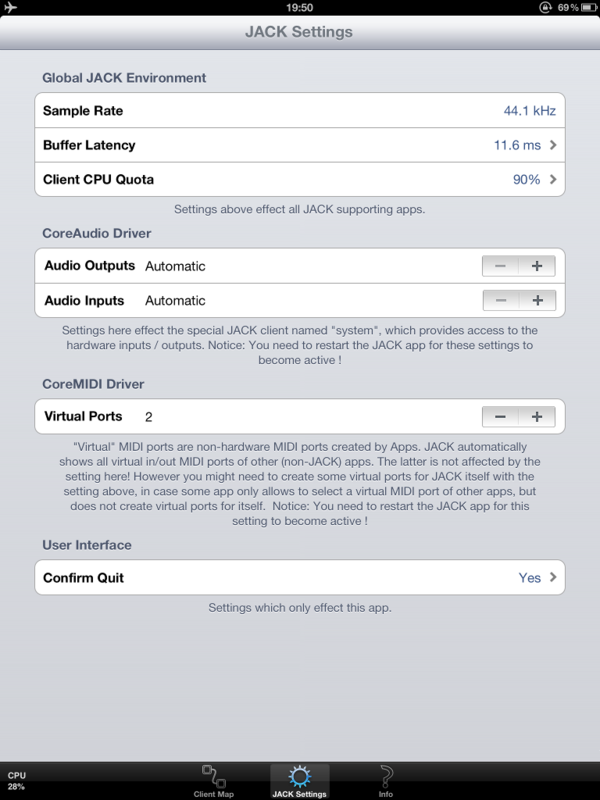 Download the JACK Software Development Kit for iOS now! JACK iOS is free and open source. Refer to the JACK iOS License Terms for the exact copyright, usage & license conditions. Everybody is invited to review the source code and to improve JACK iOS under the given open source license terms. JACK is currently available for the following mobile phones and tablet devices. In case you encounter any problems while using this app, please report it to us by using the feedback link at the end of this page. You can get JACK through iTunes from the Apple App Store. 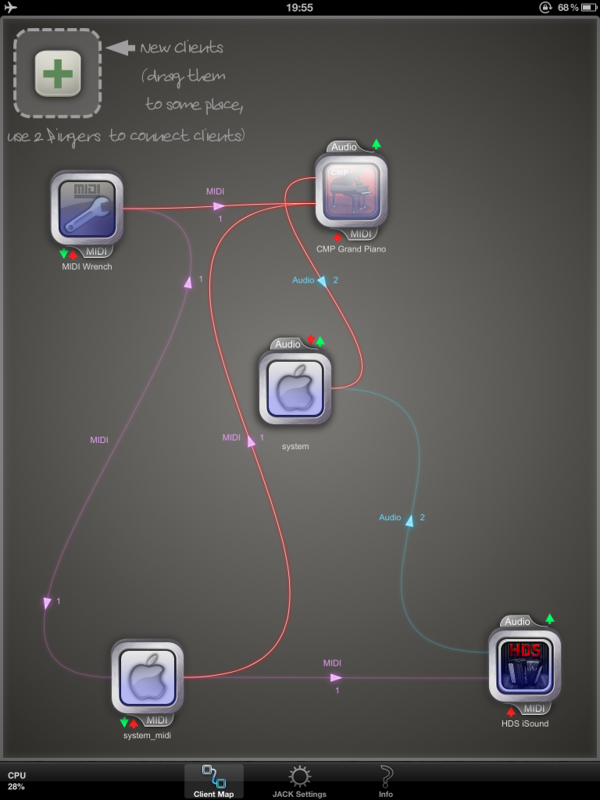 Note that you need at least iOS 5.0 or later to be able to use this app. JACK is also available for Windows PC, Linux and Mac. Find out more on jackaudio.org.